"This is a low-carb option for those who want all the flavor of Chinese fried rice but none of the guilt." Heat 2 tablespoons sesame oil in a wok over medium-high heat. Cook and stir pork in hot oil until lightly browned on all sides and cooked through, 7 to 10 minutes. Transfer meat to a plate. Heat remaining 2 tablespoons sesame oil the wok. Saute green onions, carrot, and garlic in hot oil until just softened, about 5 minutes. Add cauliflower; cook and stir until cauliflower had a tender but firm to the bite, 4 to 5 minutes. Stir pork, peas, and and soy sauce into cauliflower mixture and stir-fry until mixture is hot and slightly browned, 3 to 5 minutes. 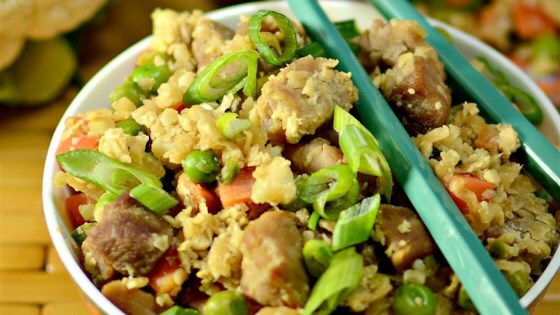 Move pork-cauliflower mixture to one side of the wok; pour beaten eggs onto empty side. Scramble eggs until cooked through, 3 to 5 minutes; stir cooked eggs into the pork-cauliflower mixture, breaking up any large chunks. Shred cauliflower using the largest side of a grater; the end product resembles grains of rice. You can use any lean meat in this dish. Way too much soy sauce. Not enough cauliflower. A lot of work. Used this recipe as a base and replaced the pork with shrimp. Delicious low carb alternative to fried rice! Hubs loved it as well!